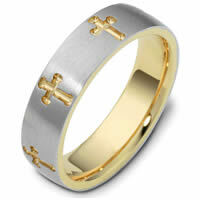 120981E Gold, Comfort Fit, 7.0mm Wide Cross Wedding Ring. Gold, Comfort Fit, 7.0mm Wide Cross Wedding Ring. 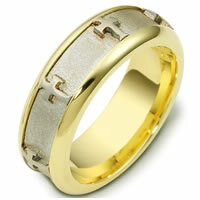 \ Religious Wedding Bands > 18K Two-Tone Gold > Item#120981E - Gold, Comfort Fit, 7.0mm Wide Cross Wedding Ring. 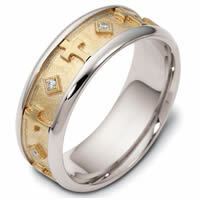 Item #120981E - Gold, Comfort Fit, 7.0mm Wide Cross Wedding Ring. 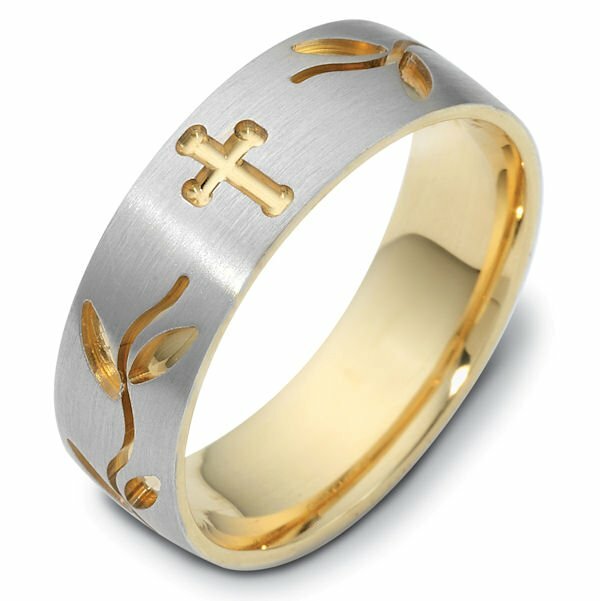 18K 7.0 mm wide, comfort fit Cross and leaves carved wedding band. 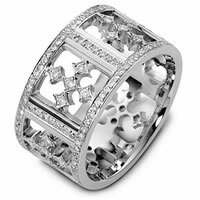 The ring has a matte finish and the carved crosses and leaves have a polished finish. Different finishes may be selected or specified. Received my platinum wedding band today. Very happy with my purchase. I priced one at my local jewelry store. The jewelry store salesperson was kind enough to tell me the manufacturer of the band I was looking at. The jewelry store price was $1895 plus tax. I found the identical wedding band here for $922 with no tax! It shipped quickly and was delivered via USPS. I highly recommend weddingbands.com! The ring selected and purchased for my future husband exceeded my expectations upon arrival. Not only did it arrive much sooner than expected but the ring is beautiful and well made. Thank you for delivering more than promised. I ordered a mens band for my future husband and I couldnt be more pleased with it it was shipped promptly and it is beautiful. The engraving is so nice I couldnt be happier with my purchase. Gold, Comfort Fit, 6.0mm Wide Cross Wedding Ring.